Kiam Collection Is Now Complete! I finally found the last two Kiam songs that I hadn’t heard! This LP popped up as an auction on eBay a couple weeks ago and I jumped on it. I have been looking to collect all the Kiam songs on vinyl, which I assume will be a years-long project. This is the third of the four Kiam LPs that I have now (they have a lot of 45s as well). However, I was also missing two songs from my digital collection of Kiam songs, and in fact had never heard them at all. Yule and Namaraley are on this record, and I now have the whole Kiam discography in some form or another. I listened to them for the first time yesterday. It’s a collector-grade piece of vinyl, very clean jacket and record, and it plays perfectly (this means I’ll have better versions of Mbale, Makonda and Azangai too, as soon as I get around to ripping them). I paid an awful lot for it, more than I ever expected I would. There were other bidders but in the end I was willing to spend whatever it took, and I scared them off when they weren’t able to outbid me. As for the unheard songs? I see why no one bothered to put them online as of yet, they’re comparatively pretty weak. But they have their moments, and I’ve satisfied my completist desire for the whole catalog. Also of great interest was the rear jacket, which has some great biographical info on it including a mantion of Lita Bembo playing in the group at one time. I had no idea about that. 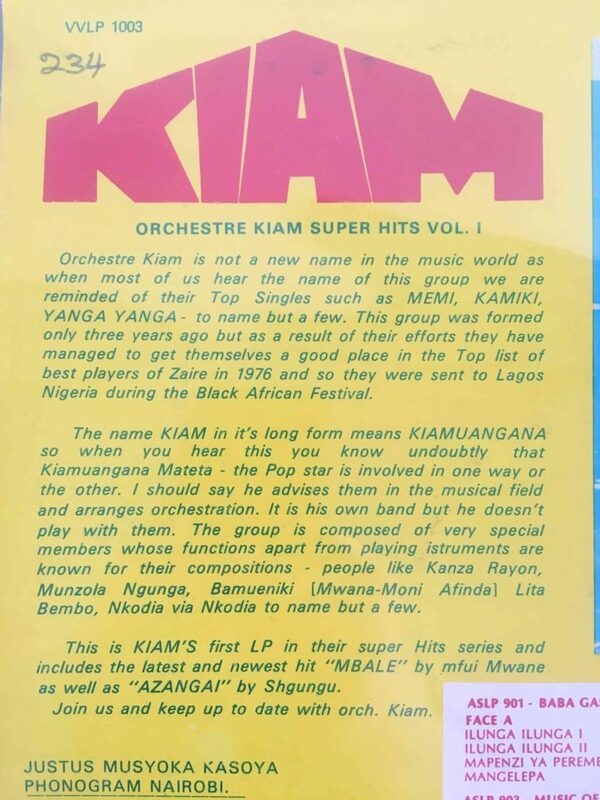 Orchestre Kiam is not a new name in the music world as when most of us hear the name of this group we are reminded of their Top Single such as MEMI, KAMIKI, YANGA YANGA – to name but a few. 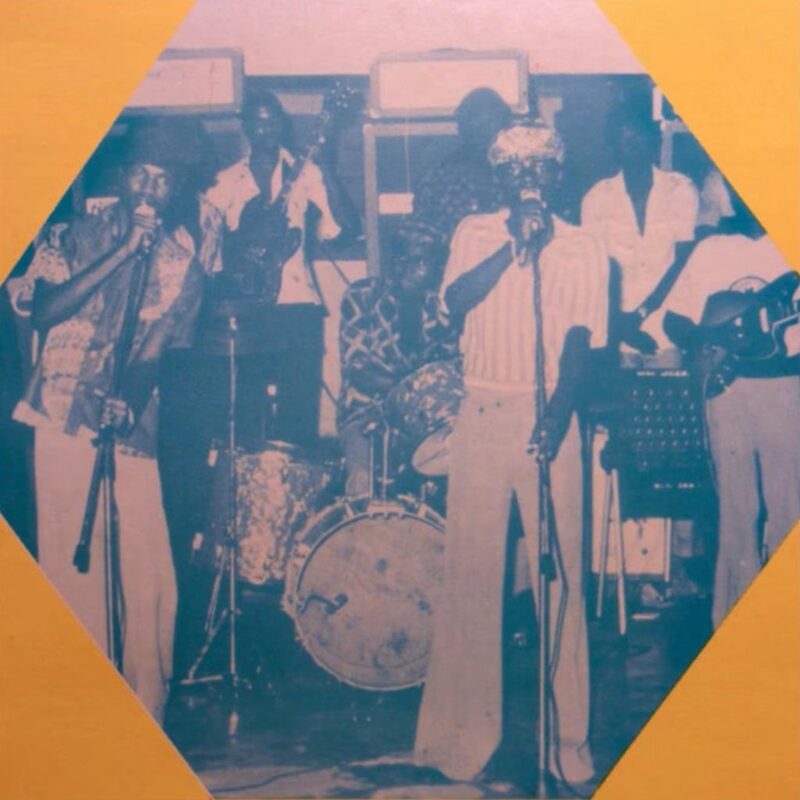 This group was formed only three years ago but as a result of their efforts they have managed to get themselves a good place in the Top list of best players of Zaire in 1976 and so they were sent to Lagos Nigeria during the Black African Festival. The name KIAM in it’s long form means KIAMUANGANA so when you hear this you know undoubtedly that Kiamuangana Mateta – the Pop star is involved in one way or the other. I should say he advises them in the musical field and arranges orchestration. It is his own band but he doesn’t play with them. The group is composed of very special members whose functions apart from playing istruments are known for their compositions – people like Kanza Rayon, Muzola Ngunga, Bamueniki [Mwana-Moni Afinda] Lita Bembo, Nkodia via Nkodia to name but a few. 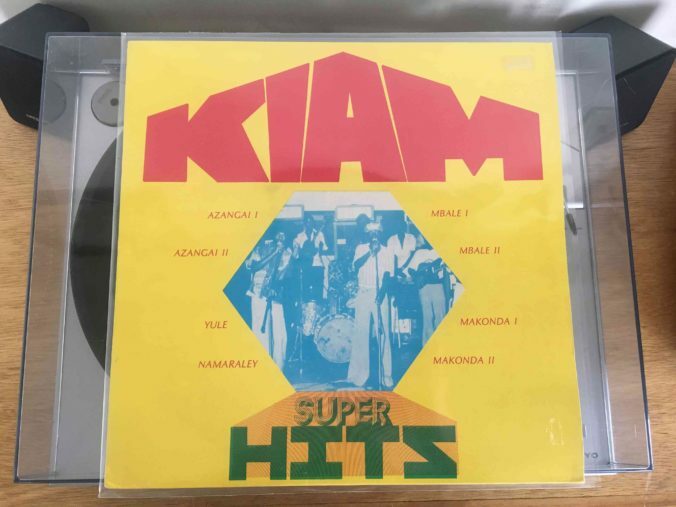 This is KIAM’S first LP in their super Hits series and includes the latest and newest hit “MBALE” by mfui Mwane as well as “AZANGAI” by Shgungu. Join us and keep up to date with orch. Kiam. Northern Thorns had been performing a song called Malevolence for quite a few shows, though I’d taken it out of our live set and never put it on Soundcloud because I don’t consider it finished. When I completed Kill Me Again, I replaced it with that in the set. Especially because of the subject matter, and because I am a white American man writing about black African struggle, I want the words to be their best form before I release this one. I’m taking December to edit charts, rerecord parts, reimagine melodies, etc. where I think that’s needed. This song will be getting a whole new comping pattern and more. I’ll get it out online before 2017. 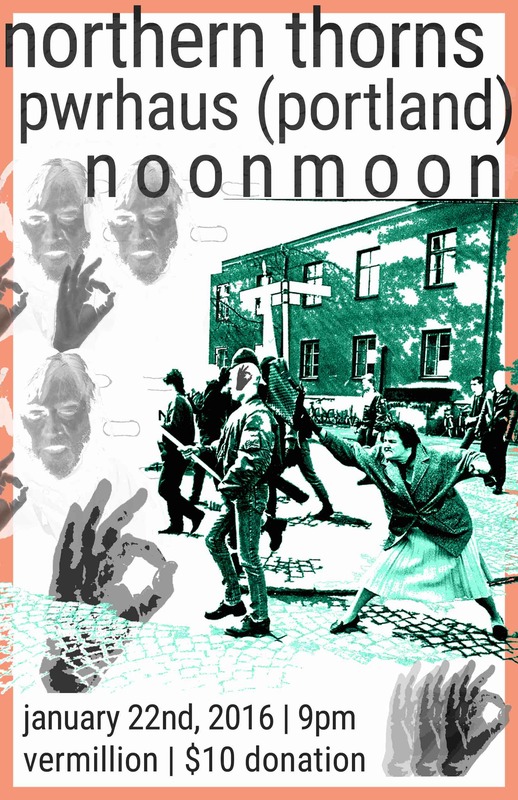 We’ll be playing a relatively short-notice show at my home away from home The Royal Room on August 16th, with friends Noonmoon. It’s an early one, show starts at 7:30. The first time we’ve played a weekday also, in fact. We’ll have yet another new lineup for this show, and I’m excited to add Austin Bustad on rhythm guitar. I’ve been waiting to play music with this guy for years. It’s been a long, busy July with much wedding and honeymoon planning and no NT shows. I’m stoked to get it out live again.